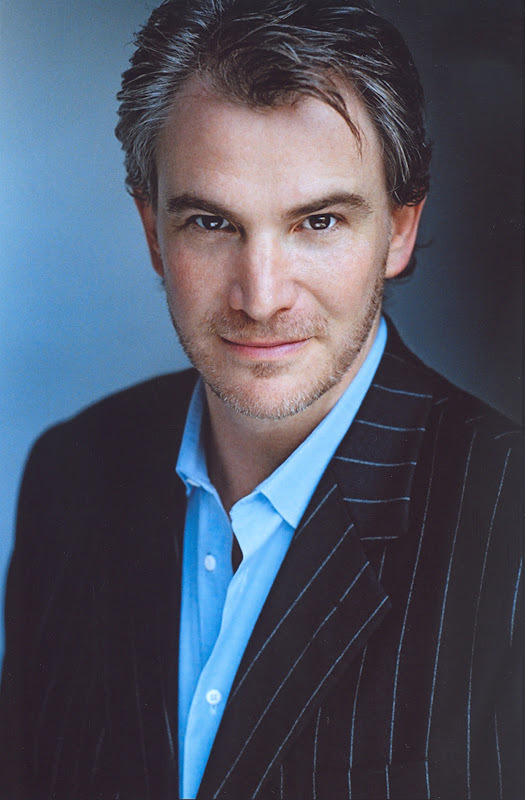 Actor/singer Douglas Sills began his Broadway career in the 90s essaying the role of infamous Sir Percy in Frank Wildhorn's musical of The Scarlet Pimpernel for which he won critical acclaim and a Tony Award nomination. 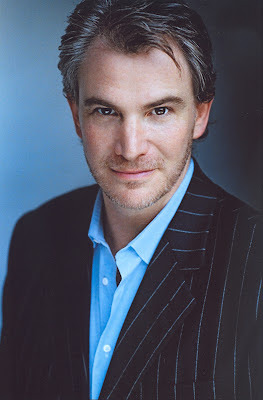 Since then, he has been in, among many others, the revival of Little Shop of Horrors, Into the Woods, The Secret Garden, all on Broadway, as well as the rarely seen concert of the 1930s Jerome Kern/Oscar Hammerstein Music in the Air with Kristin Chenoweth and a slew of musical roles in LA including Mack Sennett in Reprise's Mack and Mabel and Ravenal in the Hollywood Bowl's production of Showboat. 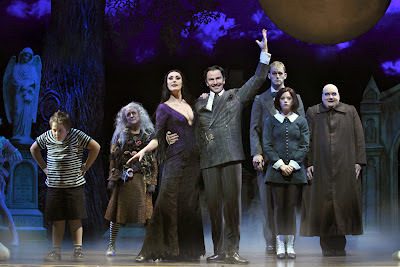 He has just started the tour of The Addams Family starring as Gomez and will open at the Pantages Theatre on June 5. In our chat, he talks at length about playing Gomez, the changes since New York in the road version of Addams Family and chooses some of his favorite all-time roles. Are you having fun playing Gomez Addams? Tell us in detail. actor, but it was very important to this producer to have the best. 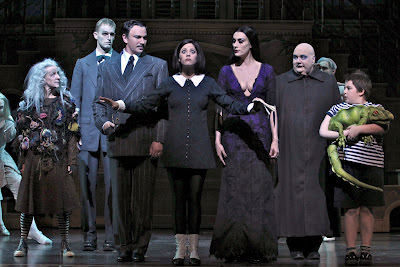 To me the entire Addams family is bizarre. How do you play Gomez as distinct and different from the other relatives like say Uncle Fester? (laughs) They're as different as two brothers can be. Fester is a solitary genius, a little like Peter Sellars' character in Being There. He's a childlike character that every once in a while comes out with these genius remarks. Gomez is much more traditional. He's a man who's had all of his dreams come true. Every day he wakes up and can't believe how lucky he is with the most gorgeous bride in the world, who thinks exactly as he does aesthetically. He thinks that he's dreaming. He has a little money, and he's very proud of his heritage, and he can indulge his most delicious appetites for sword play or exotic pets or a beautiful home in the middle of Central Park. This guy has every guy's dream: he has the ultimate man cave. It's sort of a combination of the pirate king from Pirates of Penzance and Peter Griffin from Family Guy. He's very childlike and very happy. I know there was controversy with the show on Broadway with its stars (Nathan Lane and Bebe Neuwirth). Is the tour that you're doing the same or have there been changes since New York? Like the TV series, it's very commercial with comedy first and foremost. It's pretty clever, though: the lyrics and the jokes are wonderfully sophisticated, in the way Seinfeld perhaps was. The current show is very different from Broadway. The New York show was not successful to the tastes of the creative staff or the actors. I don't think they reached their potential. I think everybody would agree with that. With a chance to take another crack at the show, everybody agreed that they wanted to go in and work on it. They did that, and the show is now 40-50% different. New songs. Where songs were eliminated, there are songs that are completely new. They're not just changed. There's also a very significant new plotline. That lends itself to new dialogue. The show has a very different feel to it. Nathan (Lane) and I are not similar types. We haven't approached the role similarly, and I had the great luxury of knowing roughly what he did... and trying something different. Is there any chance the show may be recorded with the new songs? We haven't talked about recording it, but we have set a filming date. When we get to Washington, DC in a month, a new company has come on board and paid for the rights to film the show for feature release. There will be several days of multi-camera filming of the show in performance. That will go on a feature DVD, which will have feature release and then will go out to PBS and DVD sales. This is also the edition, the creators have decided, that will be published. It also just opened in Brazil, will shortly open in Australia and shortly after that they hope on the West End. This is the show they hoped for but didn't have the opportunity to finally fix, because when they realized it needed work, they already had their Broadway date (about five years ago); they just didn't have the window. Jerry Zaks did come on board as director but he was hamstrung to some degree by a time constraint. I'm not at the point in my career where I'm interested in doing a tour; a tour is a very rough life. But...they seduced me with the premise of creating it anew with some great partners both onstage and off. Why do you think The Addams Family has stayed so popular since the 60s? Two reasons. One is that, for some reason, America, or maybe all of Western culture, have the sensational desire for this aesthetic reversal. This day/night reversal where we're drawn to the Vampire Diaries and True Blood and Twilight and Dracula remakes over and over. The whole wave that Halloween has become this national holiday, people love the premise of demystifying the scary and the terrible. If we can embrace it, the scariest things in life become enjoyable. That's sort of an existential universal for everyone. The second reason is, they're funny. And if something is truly funny, it doesn't matter how foreign or unlikely a pitch that it's going to be. If you pitch Seinfeld, for example, no one's going to buy that. Ultimately, there were magical elements that came together that made it funny. Anything else that we can attribute specifically to the 60s? Yes, when the TV series the Addams Family came out in the 60s, you have to keep in mind that our nation was glued to the television and television was funneled into three networks only. Everybody saw it. Nostalgically looking back, it was a simpler time, and the charm is that those characters were portraying average family scenarios, but with this incredibly dynamic macabre aesthetic. And so you had people just trying to cope with family issues like keeping a marriage together or raising a child or navigating an in-law. Rather than having a picnic, they were pouring hot oil off the roof onto some carolers. It's just fundamentally fantastic, and everybody loves how beautifully nasty it is. We're just drawn to it, and the appetite shows no signs of abating. Take Harry Potter. It's essentially magic; there's a lot of darkness to it. That's all analysis after the fact. Before the curtain opens on our show, you hear...(he hums the theme), and the audience is so warm and ready to be entertained. There's no time where I have to spend easing them into it. They know they're going to get to see all the characters that they love in a house that they grew to love. Fester, Lurch... but they're going to get to see them in a very modern setting. We're talking about texting, about health care, about Charlie Sheen. I think that's the biggest surprise for people. They just were not prepared for how funny it is. They didn't quite know what to expect. The TV show was only 21 minutes; we're taking them on a journey for a couple of hours. It's been a lot of fun. (laughs) I guess it would have to be a tie between Benedict in Much Ado (About Nothing) at South Coast Rep and...this. I mean the Scarlet Pimpernel was a big, life-changing role, it sort of changed my career and it will always remain a favorite. So I guess those three. I loved you in Mack and Mabel as well. Oh, thank you. I would love to have spent more time on that. That's a show where the book has been a problem. It has a fantastic score, one of the best scores in musical theatre. But the book has been a bit of an issue. It never got resolved, and I think the producers who were willing to put money in it, wanted to make some changes. Francine, the surviving sister of the original book writer Michael Stewart was not interested in giving up control. She felt she should write it and many people were not prepared to put money on her. I think that's where it stopped. Should it be the dark, drug-addicted version that they tried or should they end up more on the happier side of things and try and soften it a bit? It's hard to know when there are 12-15 million dollars at stake. What role(s) do you long to play? It has not happened yet. But Leslie Bricusse and Frank Wildhorn wrote a Cyrano that I did the concept recording for. It is an expensive show. Obviously everybody would get quite sure if my name were Hugh Jackman. It's a whole economic model. And I understand that. Hopefully it will come around. The good thing about Cyrano is that the age range is very large. You can play him at a wide range of ages. I read that you also wanted to become a lawyer.What would have happened if you had gone back to law school instead of doing the Scarlet Pimpernel? Doug Sills is coming home to Los Angeles with The Addams Family. Don't miss him at the Pantages Theatre from June 5-17! This very intelligent, fun-loving actor is really excited about his engagement here, which I'm sure will be great! 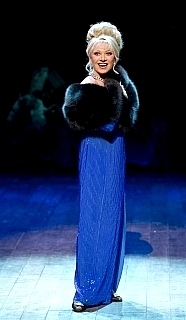 Actress/singer Elaine Paige, having originated Evita, Chess, Piaf and Anything Goes in London, is unquestionably the queen of the West End, and with a Drama Desk nomination securely in place for her Broadway performance in the new Kennedy Center production of Stephen Sondheim's Follies, which opened at the Ahmanson May 9, Paige is fast becoming a theatrical sensation in the US as well. 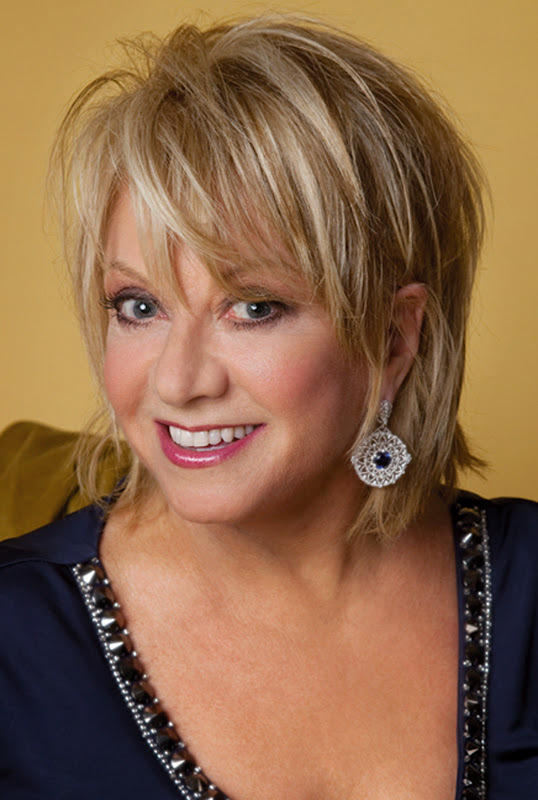 In our chat, she says what she thinks about Stephen Sondheim, Follies, Sir Andrew Lloyd Webber, Barbara Cook, her favorite career highlights including her leading men, as well as her popular radio talk show for the BBC entitled Elaine Paige on Sunday. I remember seeing you in a concert in Pasadena a decade ago and you spoke of your love for Barbara Cook. Tell me that story. I've known her work for many, many years. As a young singer, someone that was starting out on the concert stage myself, she was quite an inspiration to me. We had a small club in London called Country Cousins...and they would get many American artists who would perform there. Barbara was one of them. I remember standing at the back of the...I couldn't afford to have a table up front, so I was hovering well at the back of this sort of long, narrow sort of smallish room, and listening to her singing. I couldn't really see much, because there were a lot of people standing in front of me, and being a shortie, that doesn't help either. I could hear that wonderful voice wafting across toward me. In fact, I got thrown out of the place. One of the chaps who worked there came over to me and he looked down on me and he said, "What do you think you're doing?" I was sort of singing quietly along with her. So they told me I would either have to shut up or leave. (she pauses) I guess I wasn't thrown out exactly, but she was very much somebody that I admired as a young concert artist myself. Ah! You're in Follies! 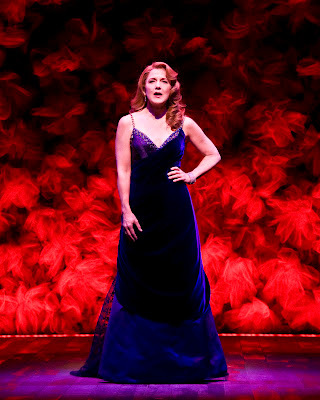 What is it like playing Carlotta and singing "I'm Still Here"? Wonderful! It's a gift of a song for any actor in musical theatre. And of course it's known, isn't it, as one of the great anthems for a woman in the theatre? It's just a great part to play. As the song says, Carlotta's been around a bit. She's known the ups and downs of life and career, and she has a great sense of humor and must, to have survived. She's always ready and quick with a joke, ready to show humor. As she says, "plush velvet sometimes, sometimes just pretzels and beer". It's been all and everything in the sense that she's known the great times and 'bum' times. I think she's also had a few problems with alcohol. Her career's been on the skids a bit. She hasn't an ounce of self-pity about her at all. She can get over anything that's put in her way; she just pulls herself up by her boot straps and gets on with it. That's the kind of person she is. She never feels sorry for herself. She's always up, moving forward and onward. There's a lot about this character that I can identify with. She's no whimp. She's been through the movies, and then she went to Vegas when the movie roles went away, and she's now a TV star. She kind of reinvents herself, and she's got a great zest for life. So it's an uplifting role to play, full of oomph (she laughs). Is this your first Sondheim show? No, no. 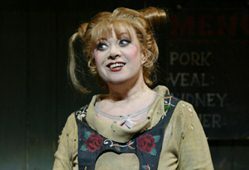 I played Mrs. Lovett in Sweeney Todd with the New York City Opera. I love Sondheim. I mean he writes so beautifully for women particularly, and he always writes strong women...strong and gutsy and out there. Of course, they're always fun to play. What else do you find unique about Stephen Sondheim? What about Sir Andrew Lloyed Webber by comparison? You've done many of his shows. Andrew is a wonderful melodist. He can write the most beautiful melodies. He doesn't write words as well. That's the thing that Sondheim is so marvelous at. He's in the old school of people like Cole Porter and so on, who wrote music and lyrics. His stuff is often very intricate unlike Andrew's that are very beautiful, sweeping melodies. Stephen's music often to the ear initially is not as melodic. It's very intricate, and yet at the same time, it can be dark and foreboding. Sweeney, for example, is very much like a musical thriller, and so is the music. I think what's great about him as a writer is that he's character-driven with the lyric writing. It's something that I really love, because as a singer, it's the lyrics that make it for me. I can't sing songs that are namby pamby. You want to get your teeth into something lyrically, and this song particularly ("I'm Still Here") is like a three-act play. You're able to move through the storytelling with the character. Your Broadway debut was in Sunset Boulevard, but do you think that Follies is your greatest American triumph so far? 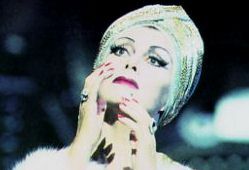 Oh, it's difficult, that one, because you know in Sunset Boulevard I was playing the leading role, Norma Desmond. That was a different ballgame (laughs) altogether really. That was fulfilling in the sense that it was the leading role and that I was onstage all the time, and for me, it had a beginning, a middle and an end. It felt more of an achievement really by the end of an evening. 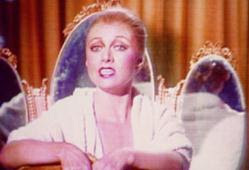 But this role (Follies) is very much a featured performance. And with that it brings its own... not problems exactly, but it's something else I've had to learn to deal with. This is sporadic, filmactic in the sense that one has little tiny bursts of scenes with a matter of a few lines, then you're not involved for a half an hour or more. It's quite difficult that, because you have to just turn it off., and then come alive and get an awful lot of information over about who you are up there in a very short space of time, with very little dialogue. So, it's tricky. What I was thinking when I asked this question was your coverage here in the US. Doing this Follies has seemed to generate more public interest in you. I certainly think...who would have thought, the amazing thing is about this...when I was asked if I'd like to do it, it was just going to be a three month run in Washington, and I didn't really know the piece that well, but I was fascinated by the idea of being able to be part of yet another Stephen Sondheim musical, which again in England is not done that often. We don't do Sondheim as much as you do over here. That's really why I took the role on, but having said that, the journey of this musical has been incredible, from Washington to Broadway for six months and now out here to LA. Just because of that journey it has given me more of a profile here. But that's not really why I'm doing it. It's always about what I'm doing rather than where I'm doing it. It's wonderful to be here to appreciate the American audiences. Are they really different from London audiences? Absolutely, yes, yes. The English audiences are very much more reserved than American audiences. To hear the rafters ring as I have been doing with this role is really fantastic. Of course, English audiences appreciate us too, but it's just much more lively here. So, that is very rewarding. It's lovely to know that one is appreciated. Of all the wonderful musicals that you've done - Evita, Chess, Cats, Piaf, Sunset Boulevard, Anything Goes...is there a favorite? 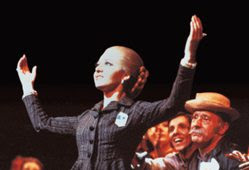 Well, of course, Evita will always be one of my great favorites, A, it was the first one to give me a career in musical theatre, that was my opportunity, and it was a brilliant role, beautifully written...a layered character, wonderful music and lyrics to sing. It really is more of an opera than a musical, and it was a challenge, in fact, musically to sing that every night. So that will always stand out for me because it was the first, and the original production, in London. Sunset Boulevard has also been a musical written in the same kind of vein, because it was all sung, pretty much. Again a wonderful character, a wonderful role, a wonderfully layered character to play...tragic... (she laughs) They're all tragic women, but strong women again. 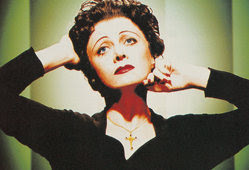 Piaf was a play with music that gave me the opportunity as an actress to dig deep yet I was still able to sing as well and it gave my audiences what they wanted. Those three stand out, but I've been very fortunate because I've been able to play comedy in Anything Goes, which was great fun. It's always great to be able to flip the coin and mix and match what you do. It's been an amazing ride with all these musicals, and of course, Chess is a favorite too because it was an original original piece. It wasn't based on a film or a book, a person's life; it was a completely original musical written for me by Tim Rice, who had always wanted to write something for me. And it gave me a number one hit single ("I Know Him So Well"), so there's nothing to beat that either. Do you have a favorite leading man? I love John Barrowman, I love Alan Campbell, he's a doll as well. (laughs) Seemingly one always falls in love with one's leading man. Alan was wonderful to work with on Broadway in Sunset Boulevard...just the most generous actor and wonderful singing voice. It was a pleasure to work with him. 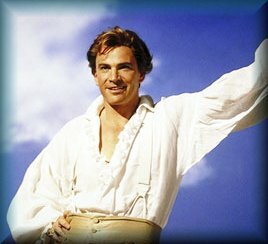 I discovered John (Barrowman) really when we cast him in Anything Goes in London, which launched his career. He took over from Howard McGillin, who was also a dreamboat, the most lovely man, and gorgeous silken voice. Is there any role that you haven't played, that strikes your fancy? I love the film All About Eve, and Bette Davis' role Margot Channing. That's one I keep looking at; I'd love to have a shot at it. 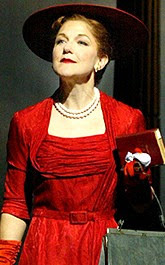 Also Desiree Armfeldt in A Little Night Music,"Send in the Clowns"; I saw Judi Dench do that. So, there are a few and people keep asking me to play Gypsy and Hello, Dolly, but the theatre is very demanding of one's time and energy...and the older I get, I think "Oh my goodness, have I got it left in me to do?" But, never say never. Tell me about your radio show for the BBC Elaine Paige on Sunday, which has become immensely popular. Huge. I have over two million listeners in England. It's a national show on the BBC. It's basically a two-hour show on Sunday, which is online now as well. I've got listeners all over the world...fantastic! It's basically all musical theatre songs and film music, and I also interview people as well. It's sort of like a Sunday Brunch kind of, easy-listening show every week. I didn't know anything about broadcasting, but when they asked me to do it, I was having a down time in the theatre, and I thought "That might be fun to do" and of course, it took off. So now it's become a part of my life that I really rather enjoy to do. It's very relaxed and a fun weekly event in my life. Any other plans after Follies? This has been a longer run than one had at first suspected, so I shall take a little time off after this and look for something interesting to do. 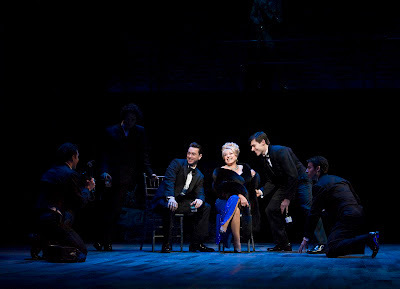 Elaine Paige loves to chat...what a charming lady... and fun! She brings such personality and humor to Carlotta Campion and makes her truly memorable. See her in Follies at the Ahmanson through June 9. It's everything you could wish for in a musical...and more. 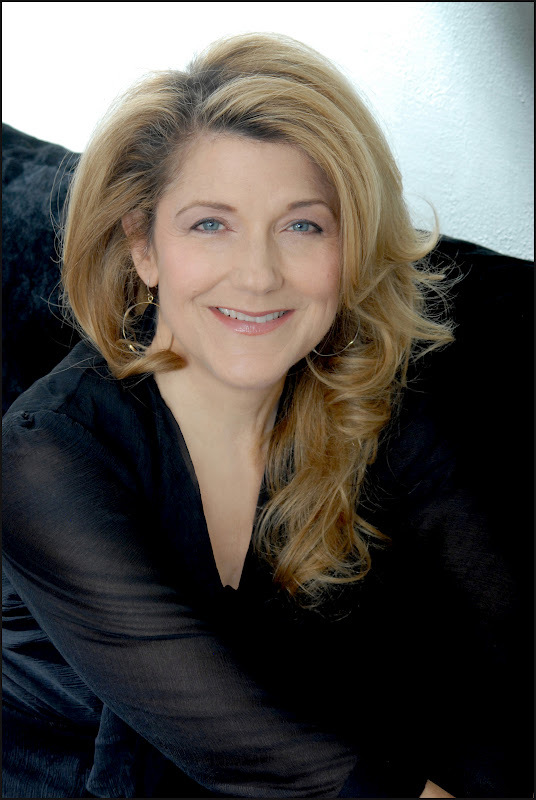 Tony Award winning actress/singer Victoria Clark is currently co-starring in Follies at the Ahmanson in the complex role of Sally Durant Plummer. 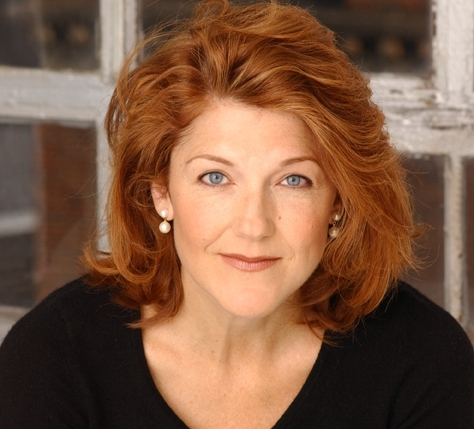 In our chat, she talks about Follies, Sondheim and some of her other favorite roles. What is it like playing Sally Durant in Follies? It is a complete joy and thrill. It is one of my all time favorite roles. She is complicated and wonderful, and I love her. I understand what she is going through, and I have great sympathy, empathy, and compassion for her. And she is a puzzle in many ways--lots of exploring and digging to do. What is different about this role from others you have played? Every role comes with intrinsic highs and lows. The joys and challenges for me are making every character I play human and believable. Sally has beautiful music to sing, to express what she is going through--this score makes this role a particular delight. The biggest challenge is not to make Sally a victim. I don't think she is. I don't like to see women onstage who are victimized. I prefer to see and play characters in such a way that we see them pull through their set of circumstances and obstacles with dignity and as much poise as they can muster. Another challenge are the short scenes. They are snapshots of a much bigger picture of characters with a 30-year history. That back story has to be in place as well as details; then, the scenes themselves are like eavesdropping into seismic personal rifts and discoveries. What do you like about Stephen Sondheim's work? Sondheim 's work has a complexity and depth that are a dream for me and most actors. The more you dig, the more your find. He is the goldmine of thinking actors, and has made our whole world so much better for the work he has produced. He has given us permission to look at ourselves in an honest and unflinching way, which can be both a comfort and a catalyst. Was it difficult stepping into this role just for this LA engagement? Yes, it was difficult in the most joyous way imaginable. 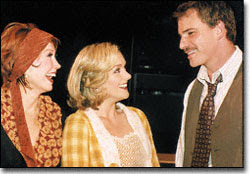 With colleagues onstage beside me like Danny Burstein, Ron Raines, Jan Maxwell, and Elaine Paige, how could this experience be anything but remarkable? Eric Schaeffer, Warren Carlisle, and James Moore allowed me the space and time to truly create, and that was an immeasurable gift. The creating is still ongoing--there is always more to solve--the learning never stops. And life itself should be a constant process of educating ourselves--rehearsal and real life walk hand in hand. Talk a little about Light in the Piazza. The role of a lifetime in the most beautiful musical ever written. What more can I say? Talk a little about Sister Act and your role in that. A wonderful journey with long-time friend and director Jerry Zaks, and my first time working with Alan Menken. Also a joy. What is your most favorite role to date? Why? Well, of course Margaret Johnson in The Light in the Piazza will always be at the top of my list. She is soulful, funny, complicated, resilient, and romantic. And a Southener! Everything I personally strive to be. Playing that part made me a better mother and a better person. The whole experience was filled with a kind of grace for me. Piazza taught me a lot about forgiveness and letting go. And I was introduced to the remarkable Adam Guettel, Craig Lucas, and Bartlett Sher who all showed me the way and gave me their trust. Is there a part you're itching to do? Not really. I go with the flow. There are several projects on the stove.. Life and work have to be balanced; I have learned that. My life has been blessed. It seems that the right roles find me at just the right time in my life when I can provide the insight and skill set needed to allow the character to jump off the page. I have worked with so many of our business' greatest writers, directors, and actors, and learned so much from each one--my life has been nourished and blessed by each person. I just have enormous trust that I will end up where I need to be to make the biggest difference possible. And that she does! In every single role she plays! 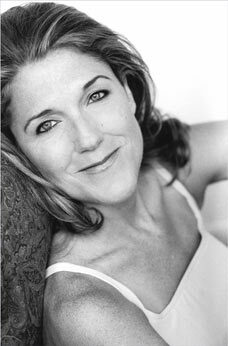 Don't miss Victoria Clark in Follies now until June 9!